Bring eggs to a boil in large pot of water, then reduce heat to a simmer. After cooking eggs for 11 minutes, drain and place in a bowl of ice water. Cool completely. Crack and peel eggs carefully under cool running water. Slice in half lengthwise, scoop out yolks and place in a food processor with mayonnaise, peppers, mustard and paprika. Process yolk mixture until smooth, season with salt and pepper to taste. Cover and refrigerate egg whites. Cut chives into 16 1/2-inch pieces and set to the side. Transfer yolk mixture to a Ziploc® bag, squeeze out air, seal and snip off a corner with scissors. Pipe about 1 tablespoon of the filling into each egg white center to resemble a pumpkin. Place a cut piece of chive diagonally into the filling to resemble the stem of a pumpkin. Sprinkle filling with paprika. 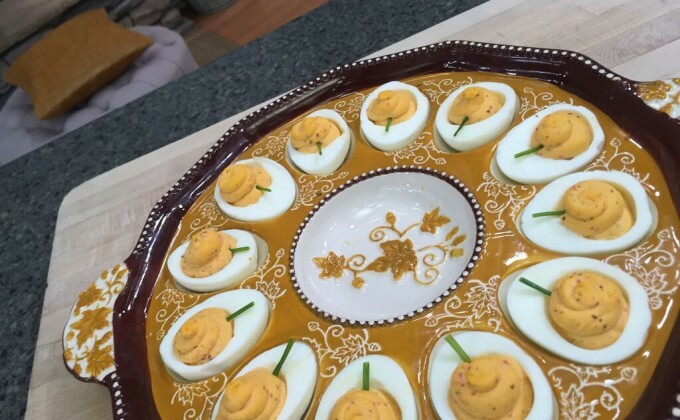 Serve immediately in your temp-tations® Set of 2 Egg Trays.